James B., 53, of Schaghticoke, NY, will be inducted into State University of New York at New Paltz Hawks Hall of Fame. 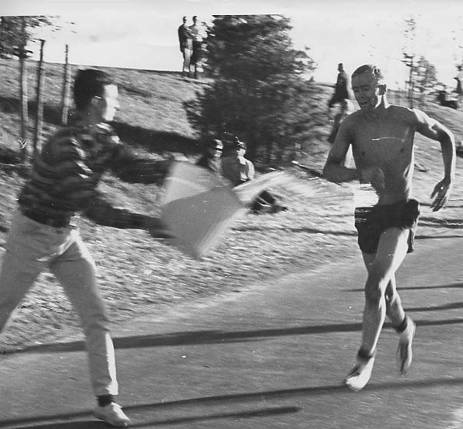 In 1970, Borden was able to overcome a rare genetic skin disease that prevented him from sweating, and ran the 1-mile and 2-mile races for the university. Borden will be recognized for his athletic accomplishments at New Paltz's Induction Dinner and Ceremony on Saturday, May 4. More than thirty years ago, Jim's track coach, Joe Owens, and his teammates formed the bucket brigade and doused the athlete with buckets of water as he ran his races. The water enabled Jim to keep his body cool, which allowed him to compete in the sport where he excelled. Jim broke the school's record in the 2-mile event. Jim is affected with ichthyosis, a rare genetic skin condition characterized by dry, cracked, scaling and thickened skin. Individuals with this disease commonly have the inability to sweat because their skin is so thick. Water cannot break through to the outside layer to cool the body. Jim and Coach Owens received national recognition when Newsweek Magazine featured a story about this creative way to overcome his medical obstacle and pursue a dream. Because of this national recognition, many other individuals who were affected with ichthyosis contacted Jim. These individuals, ultimately, became the founding members of the Foundation for Ichthyosis & Related Skin Types, Inc. The Foundation is the only organization in the country dedicated to helping individuals and families affected by this rare disease. After graduation from New Paltz, Jim became a successful dairy and fruit farmer and married. Jim and his wife, Linda, have two children, Christopher and Patrick. Jim has served as a Cub Scout Leader, Boy Scout Leader, volunteer fireman, and a participant on the Youth Commission for his area. Jim is currently in his sixteenth year as councilman for the town of Easton, Washington County, NY.